Russia and UK held their first ever “2+2” meeting in London, as part of a new “strategic dialogue”. Heads of the foreign affairs ministries and defence ministries from Russia and UK are expected to discuss Iran’s nuclear programme, North Korea and Syria. “Minister Lavrov and I will discuss major topical foreign policy issues such as Syria, Iran and the situation in North Africa,” said William Hague, UK’s foreign secretary. According to the Russian ministry of foreign affairs, the two sides will touch upon issues of European security, including the cooperation in missile defence architecture and the current situation in West Asia and in the Arab world in general. “The sides will discuss the current state and prospects of Russian-British military cooperation and exchange views on the military-political situation in some parts of the world,” said a spokesman from Russia’s defence ministry. Last year Russia’s President Vladimir Putin and David Cameron, the British prime minister agreed to begin a new strategic dialogue using a “2+2″ format. “The Strategic Dialogue is to become an important tool of political dialogue and practical cooperation between Russia and the UK in the realm of foreign policy and defence that will promote trust-based discussion and reconciliation of stands on the most acute issues of the international agenda” saysa statement on the Russian Embassy in UK website. Individual meetings of foreign and defence ministers are also scheduled to enable detailed discussion of the prospects of boosting Russian-UK ties in political, trade-economic and cultural spheres along with military and technical cooperation. 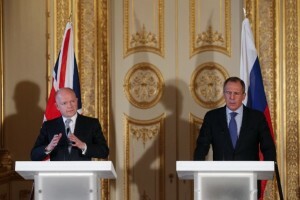 Hague also stressed the need to discuss the increase of Russian gas supplies to UK. “I am aware that Russia is interested in exporting more gas to the UK and I hope that this is something our respective energy ministers might explore further together,” Hague said, adding that any contract for gas supply is a commercial matter due to meet EU as well UK regulatory requirements. Commenting on the merger of Rosneft and TNK-BP, Hague hailed BP’s commitment to working in Russia. “Russia is a vital energy supplier for Europe and needs partnership with international energy companies to develop its oil and gas fields,” he said. Britain recently extradited a Russian national, Maxim Vintskevich, back to Moscow. Russian officials have praised the move as a “breakthrough in our bilateral relations”.